Transparency Market Research has released a market study, titled “Solar Cell Films Market - Global Industry Analysis, Size, Share, Growth Trends, and Forecast 2015 - 2023”. According to the report, the global solar cells market will expand at a CAGR of 9.40% from 2015 to 2023. If the figure holds true, the valuation of the market will be US$20.9 bn by the end of the aforementioned forecast period; the market stood at US$9.4 bn in 2014. Owing to the numerous benefits of solar cell films, the demand for the same has been on the rise over the past few years, thereby benefitting the solar cells market, says the report. Second-generation solar cell films are exemplary with respect to the advantages they offer over their predecessors, which used a much thicker wafer. The advantages of solar cell films include low manufacturing costs, high product efficiency, and zero carbon emissions, which serve the energy needs in an economic manner with a consideration of the environment as well. The use of solar energy reduces the dependency on conventional fuels for energy needs. This helps save conventional fuels for high-intensity energy production, where solar energy is not effective. Thus, energy security for the long run is ensured as well. In this pursuit, environmental and government agencies are offering subsidies to promote the utilization of solar cell films for commercial and domestic energy needs. 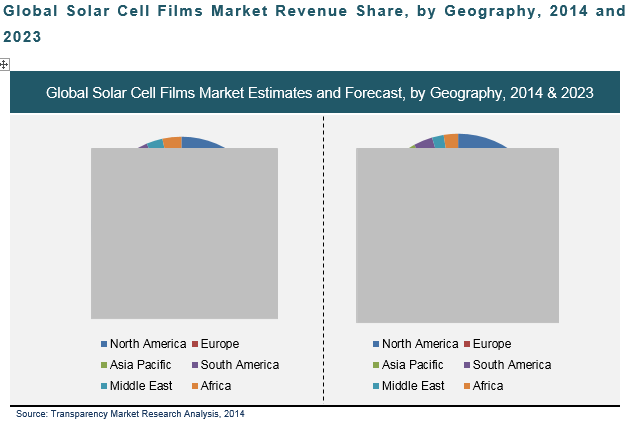 The report divides the global solar cell films market on the basis of product type, end use, and geography. By product type, amorphous silicon, copper indium gallium selenide, and cadmium telluride are the segmnets of the market, amongst which cadmium telluride led the overall market in 2014. The reasons for the high demand for cadmium telluride are longer life, low manufacturing cost, and high product efficiency in the range of 16%-18%, which is the highest among solar cells. The efficiency of cadmium telluride is due to its high sunlight absorption power, which in turn accelerates the energy output of these cells, due to which they are preferred over other solar cell films. Industrial, commercial, and residential are the major end-use segments of the solar cell films market. The commercial sector exhibits the highest demand for solar cell films due to high electricity needs, especially during peak working hours. The advantage of solar cell films for the commercial sector lies in its unlimited capacity of power supply and low maintenance cost, because of which the energy source is viable for offices, malls and multiplexes, and shopping complexes. To promote the utilization of solar energy in the commercial sector, governments in several countries, especially in countries that are close to the equator and have high-intensity sunlight for a major part of the year, are offering financial incentives and complimentary installations to harness the energy. Attractive feed-in tariffs are also provided for citizens who supply excess electricity to the grid. Some major companies operating in the solar cell films market are Heliatek GmbH, 3M, First Solar Inc., and Stion Corporation, among others.